I began the Black Ram Hand project when I stumbled on the Instructables 2016 3D Printing competition. I love competitions, but not all competitions. For me to be interested they need to have a big enough prize to attract my attention and a high enough chance of actually winning based on skill and not luck. This competition certainly attracted my attention with 15 3D printers up for prizes and it being based on 3D printing, I was sure I could not lose. So with 40 Days on the countdown I got to work, brainstorming and thinking about what I could make that would both be interesting and show my skills in design. I spent a lot of time searching the internet searching for things that I could design. With my work in the medical device field I was interested in making something that could help people. At first I found and was looking into a shin guard. Why? Because through my internet search I had found videos and images of 3D printed structures that could absorb shock and rebound (return to previous shape). I theorised that I could make a print with these structures that would help soccer players absorb the load from a kick in the shins. I started sketching to try and layout what I would make and how put it together. I became a little bored on this concept and decided to move on to something else. I found my way into 3D printed prosthetics as a new line of design and began looking into different body parts like legs and arms. That's when I found the E-nable Project. I was totally inspired when visiting this website. It was full of great knowledge and people helping others to design and print these prosthetics for children. While I reviewed the designs and CAD files I was able to read and understand the challenges they face when fitting and implementing the hands. With all this information in mind I kicked off the Black Ram Hand design. BTW... I am a terrible sketcher. But I usually just need enough of a rough drawing to get me started into CAD. Staying with the mindset of making something different, I found that none of the e-Nable hands was able to let the kids catch a ball at speed. I focused on this as my main requirement and goal for the design. As a secondary requirement I wanted to make the entire apparatus completely 3D printable so that no other items were needed for its assembly. There are many conditions covered under the different designs on the e-Nable site, but when you design you have realise that you cannot help everyone in a single design. As this was to be my first design on such a problem I would limit myself to requiring a functioning wrist and enough palm to push for activation. First I tackled the wrist action and sliding mechanism. To make the wrist activate I needed to design the linkages so that they were able to move with the action of the wrist. The bending wrist would translate into a linear sliding action. I quickly designed the first prototype to see the model. This stage is critical because before I want to spend many hours designing something with a nice form and finish I want to definitely know that the concept works. So I use very basic and quick CAD techniques to make a functional working model to print and operate. Once I have tested it I can tweak the design if I see things are not working or scrap the idea. Each new iteration of the design brings me forward to a better functioning design. This is know as Iterative Design. I printed my Black Ram Hand Prototypes on my Fabtotum, but it was a horrible pain to do so (I wrote a post about this). I wanted to do what I did at work which was: DESIGN - SEND TO PRINT - SLEEP - WAKE UP TO PARTS - REPEAT. Instead I spent many sleepless nights checking if the printer was still working and fixing it if it broke down. If you are serious about designing parts and using a 3D Printer my advice is to buy a great one with lots of great reviews that is reliable and robust. Pay the extra money for a printer that works all the time. I tested this sliding mechanism with the 3D print. and it worked. The linkages performed as I had hoped (sorry guys I did not take any photos at the time and the parts have now gone into the bin during a cleanup). So with my design tested I began making the next round. With proof of concept completed I moved on to refining a design to be functional and aesthetically pleasing. Normally for each round of design I will start with a brand new CAD model, unless I am merely tweaking or refining that design. Each new iteration model teaches you something new and helps you retain what works and what does not from the previous one. When I first started engineering I thought that the engineers would just all have the answers and know what to do straight away. But I have learned that real engineering is about solving a problem in small steps and refining, not one grand design at the beginning. The Mark II was my first attempt in making a nicer design, but as the design evolved and I tested 3D prints, I was running into problems of over constraining the sliding mechanism and making parts that were not functioning like the Mark I. Also the forearm slots to secure the velcro to strap to the arm were very weak and would snap. So I decided to kill this version and try to re-imagine the slider mechanism. The Mark III was where the design really took shape and built mechanical basis of the future design iterations. I had focused on the claw design, its opening/closing and how it would attach to someones hand. The claw mechanism uses a central slider to activate 3 claws at 120 Degrees to each other. Its centre linear motion translates into rotation on each joint allowing the claw to open and close. It required me to design with clearance and tolerances in mind so that the claw was always free to move. But I once again ran into troubles with the slider mechanism. It was too "sticky", meaning that I could not bend my wrist quickly or freely. I believe that this was because there was too much friction with the printed parts that suffered from blobs on the 3D printed surface and there was too much surface area contact on the slider. 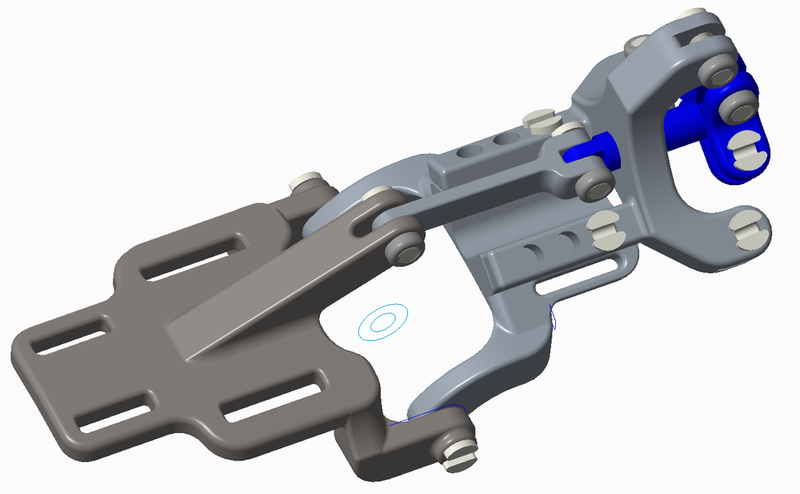 I had not yet designed the attachment between the forearm and hand and could see that this version ran out of space to make the connecting slider linkage. So this design round was over, but the claw mechanism worked great so I kept this CAD and brought the model forward to the next design iteration. With the claw mechanism design sorted and tested I just focused on getting the slider working correctly. I always make faster progress when I am just concentrating on one problem. The design for this final slider came quickly once I was able to not worry about the rest of the design. The slider was now already in the claw so I only needed to ensure that the linkages would translate the wrist rotation and still allow freedom of movement. Several tweaks latter and the intermediate part was complete. Now with the functioning parts complete I would move on the the final design, not for function but looks. I spent time designing how this would attach to the arm and making the forearm piece as nice as possible while still maintaining the strength of the velco strap slots. In CAD I would show this as a full design model so all pieces could be seen in their final positions. As this was a aesthetic model I also began the process of designing all the different claw attachments that would be attached to the model. This gave additional variety to the whole concept of the hand. Once you hit a certain stage in a design (mainly after many, many hours) you are working on your brain will start to throw up additional things that you can add or change. Claw concepts came to me very quickly because I now completely understand how the mechanism works, this will happen to you as well when you learn to design. So with the design work done and numerous prints and tests completed did I complete what I set out to achieve? 1. Entirely 3D printable? Yes. 2. Can a child catch a ball? Well... I could. I promise I did let my Nephews try it out and with a few practise throws they were catching the Ball. So I felt good that I managed to get it working. and meeting my own design requirements. So I entered the competition, wrote up an assembly and printing guide and hoped that this was enough for me to win at least one of the printers so that I could replace my stupid crappy one at the time... Well no it was not to be. For my time and work I received a runner up pack which included a T-shirt and a $50 3D hubs voucher (this voucher turns out to be very valuable in the future). To be honest there were some really great entries that beat me in that contest, but still when you enter a contest with judges they make the final call and that's just the way it is. I thought about giving up completely for future contests... but I am glad I didn't. Because the MARK VI really blew away my expectations.